This stand-out trophy features the letter “V” with a cheerleader mid-jump, pom-poms in the air, in the foreground. 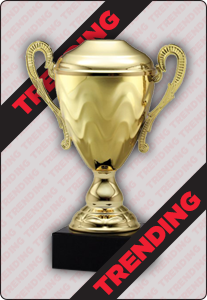 This resin trophy is silver in color with gold accents. The trophy can be engraved with a commemorative message or event details.